When teaching English we often have the students compare and contrast two things. I thought it was time to do that with my Juki 8700 to my Janome 1600P QC and my Janome 8900/12000. I’ve been learning more about my Juki machine as I’ve been using it. Hopefully I can make some noteworthy comments here. If you are new to reading here, I did recently get an industrial machine - a Juki 8700 and talked about that here. My Janome 1600 P QC is at the shop so I just took a picture of one off the internet. The sizes are comparable. All three machines are heavy duty machines. The Janome 1600 is advertised in Poland as an industrial machine, but I think of it as semi-industrial. None of them can be moved around easily on any surface. All three of these machines, once you have used them make it difficult to go back to a tiny little machine like a hobby one. The solidity factor can’t be beaten.I used to shove my little Pfaff Hobby all over the place when I was quilting. The Janomes are heavy duty and won’t be shoved easily. The Juki can’t be shoved as it sits down into an embedded space. The Juki is heavier than the other ones, though, and absolutely can’t be carried to your local sew-in. You could theoretically do that with the Janomes, though not easily. The heavy duty feature is the main common feature of these three wonderful machines. I do have acrylic tables for both the 1600 and the 8900 which help - I’d love to have the 8900 lowered into the counter top. The Juki has no extra stitches. It straight stitches and goes backwards. No thread cutter, no needle threader. The sewing is free and easy and effortless. I think it actually “sews” more easily and freer than the 8900. It is about the same as the 1600. The 1600 has only straight stitch sewing as well but has a thread cutter and threader, though I didn’t have that figured out very well. The 8900 has it all - hundreds of stitches and you can program more, lots of feet, LCD screen, etc. It’s programmable. It’s digital. It’s a full service, luxury machine. The Juki and my Janome 1600 are both very good at NOT eating fabric when you first start a seam. The 8900 isn’t as good about that, so starting with a feeder fabric or scrap piece is helpful, though not entirely essential. 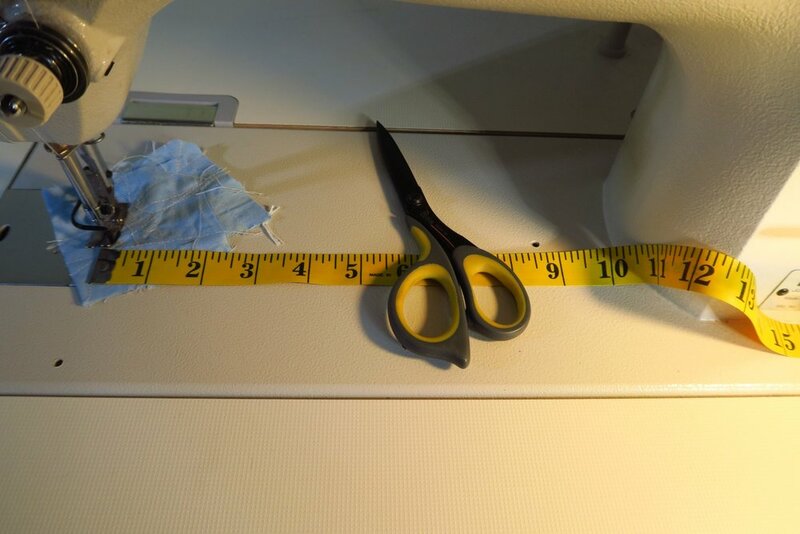 You will see a scrap of fabric in the 8700 and that is primarily so that I don’t have to actually lift the pressure foot when I take off something I’ve sewn. Instead I just sew onto a scrap of fabric and then cut the threads and avoid raising the pressure foot altogether. 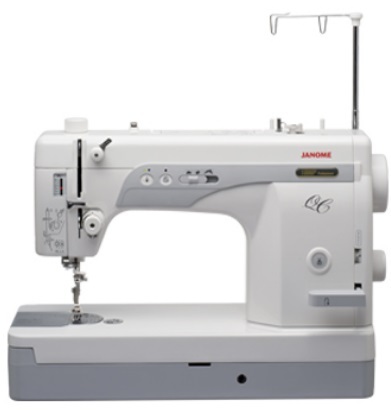 The Juki is fast - much faster than either the Janome 1600 or the 8900. The Janome 1600 goes 1600 stitches per minute (spm) max and the 8900 is 800 spm max the Juki is 5000 - 6000, depending on whose literature you believe. Whatever. It’s fast! Due to the speed, I’m guessing, the Juki has a finger guard which protects your finger from actually getting close to the needle. While super helpful while sewing in keeping you from accidents, it does making threading the needle a bit hairy (For these eyes - yes, it’s difficult - I’m working on finding a better solution - thankfully I don’t have to thread it that often). The Juki has a surprising 10+” of throat space. ﻿The throat space is less on the Juki 8700 than on the 8900 which has 11+”. It measures 10 1/4” from the needle to the edge of the body so it’s not too shabby! The 1600 has about a 9” throat. The metal thing sticking down here in front is the pressure foot lifter. This has a knee lifter only. When I bought the machine I got the whole frame you see here - except for the thread, of course! The Juki has the pedal built into the whole frame which came as one complete unit. When I bought the Juki, it came mounted onto the frame. My husband did set up the thread stand which was taped down on the bottom part of table itself. I had to buy my thread stand for both my 8900 separately. The 1600 came with a thread stand though much smaller than the Juki’s stand. The pedals for the Janome 1600 and 8900 are just standard typical foot pedals that run all over the place unless you put them up against something so they won’t move. Also you use your knee to lift the pressure foot, not your hand, though there is a lever you can use on the back of the machine up towards the top.. The Janomes did have the option to use either the knee lifter or use your hand to lift the pressure foot. I’m still getting used to the knee lifter. 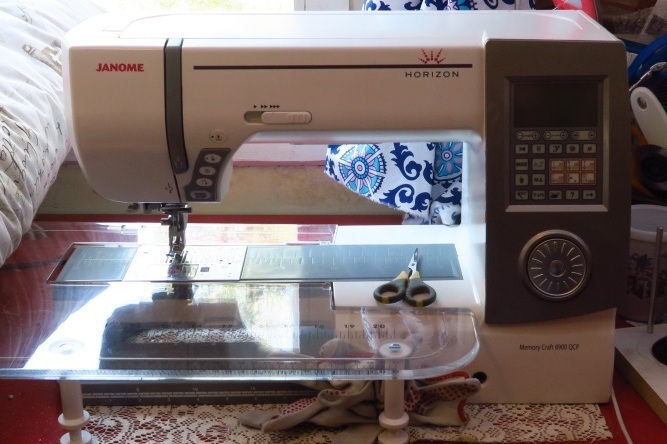 The Juki 8700 and the Janome 1600 have a similar way to threading the machine - and it is a bit different than any other machine I have had. I love the fact that all is exposed. I can get to the tension disk and knobs for cleaning. The 8900 is like my other machines I’ve had my entire life and I could do it without the manual. I needed the manual for both the Janome 1600 and the Juki. My biggest frustration about the Janome 8900 is that if there is a piece of lint stuck in the tension disks, you can’t see them to clean it out! I can’t explain how frustrating that is and I wish they built them differently so that the owner of the machine could get to that section without voiding the warranty. I wish the makers of these machines would read this and fix that problem! I have spent literally hours trying to get a piece of something out of there! I know, I need to get the lint off but this shows the side winder really well. The Juki takes a round industrial needle while the Janomes take the regular kind of needle with a flat shank that you can buy everywhere. 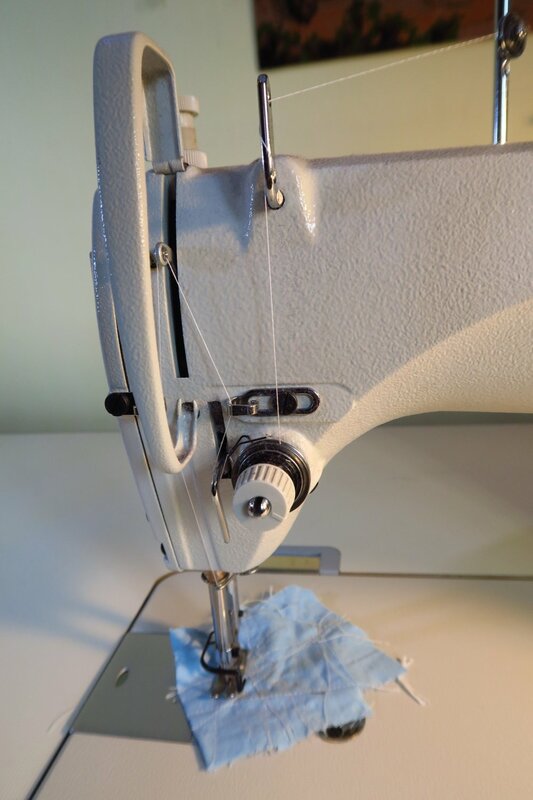 When I changed the needle on the Juki the first time, I didn’t realize that there was a groove on the needle that had to face the throat of the machine or the thread would constantly break. I struggled with thread breaking for a day until I finally came and watched a video on You Tube about it and the guy happened to mention to put the groove on the right. I felt pretty stupid as apparently I had skipped right over that in the manual since I had reread the threading section of the manual. The Juki has no extra lighting. I’m still trying to figure this out. I want to buy a LED strip and put it around the head of the machine but haven’t done that yet. I have 3 other lamps set up nearby trying to get enough light to work with. The 8900 has a lot of lights built into the head of the machine. The 1600 had one light - thus I have a free standing lamp nearby. 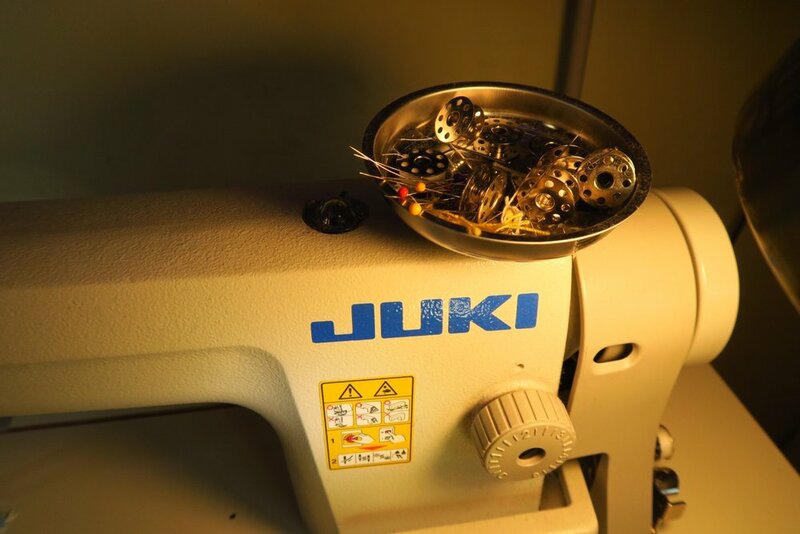 The Juki 8700 is a mechanical machine and is made of metal. I put a nice magnetic pan on it and it holds my pins, a few bobbins, and my seam ripper. I can’t do that with my Janome 8900 and never tried with the 1600. My 1600 is also a mechanical machine, however. The Juki is self oiling as there is a pan underneath the machine which sets into the table and you fill the reservoir with machine oil - whereas the Janome 1600 needed oiling in 2 main places, but it wasn’t quite clear how often to oil and it wasn’t easy to get to the part under the needle to oil - which is may be why the motor needs replacing (frowny face). My Janome 8900 claims to not need oil except to put it on the wick underneath the bobbin area from time to time. This is probably the most intimidating feature of this machine when I first saw it (on You Tube). However, the idea also fascinated me. I realized that with the intensity with which I sew, that quite possibly this is exactly what I needed for my piecing. In Poland the industrial Juki cost about $500, the Janome 1600, about $1100 and the Janome 8900 about $2-3000, depending—I paid under 2K for mine a few years ago. I hope this helps you! 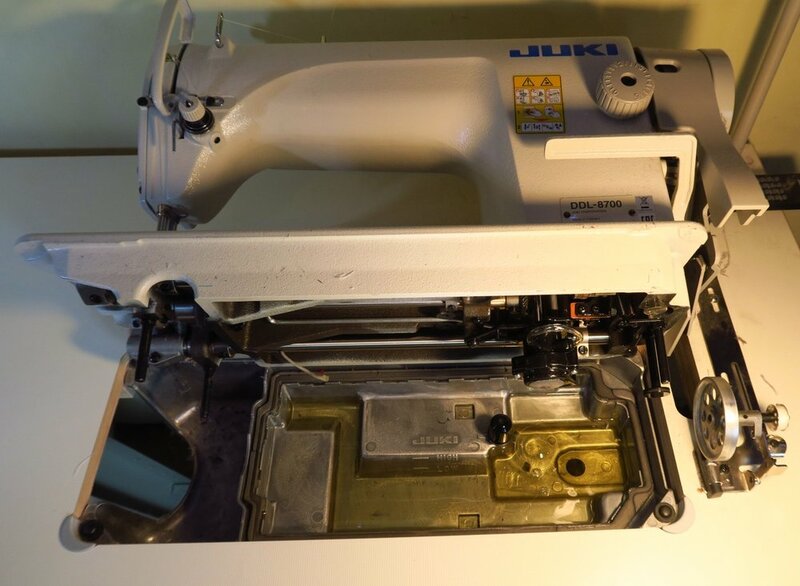 If I find other things that are interesting, I’ll add to this post as I learn more about my Juki industrial machine. Each of the machines has its place and function. I’m using the Janome 8900 for quilting, the Juki 8700 for piecing and the Janome 12000 I have for embroidery/backing up quilting machine. Right now my Janome 1600 is at the shop. I’ve ordered a new motor for it and when they fix it they will send it back to me. At that point I will have to decide what to do with it as I am keeping the Juki - and it sits in the spot where the 1600 sat. Yep. It got usurped. Thankfully, machines aren’t people with emotions. It will never know or feel hurt that its position is gone. And that’s all from Poland from me today!